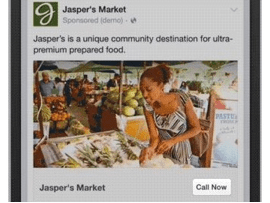 Facebook has launched a new feature that will allow business to add a “Call Now” button to newsfeed ads. When a customer views any ads in the news feed then they can just click on the Call Now button available in the ad and they can automatically connect directly with the business advertiser through the app. This new button has joined in the group of Get Directions button which was launched in October last year. The “Get Directions” button shows the route from the user’s location to the business’s physical address. The option for Call Now button is currently available for local awareness ads in Australia, Brazil, Canada, France, Germany, Italy, Spain, the U.K. and the U.S. The newly added button will allow the user to interact with the business advertiser directly through their news feed.